This camouflage is also called as “6-color desert camouflage” or “chocolate chip camouflage”. 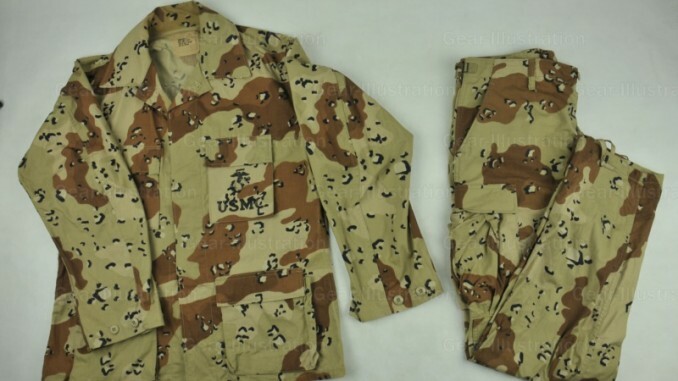 A special kind of desert camouflage uniform, their NSN ranges from 8415-01-016-2563 to 8415-01-016-2576 continuously, since NSN-NOW hide tech info in public search result on these NSNs last year, I only know 8415-01-016-2572 is Medium Regular size. Assign date 1976-02-07.These special 6-color BDUs are in RDF-BDU (a pre-BDU version) type ,twill texture. They are manufactured for Saudi Arabian Army.